Opening this Wed, April 1st at the Chicago Tourism Center, street artist Ray Noland and official Campaign design director Scott Thomas present Officially Unofficial, a showcase of print art inspired by and during the Obama 2008 Presidential Campaign. Readers may remember AM‘s Manifest Hope coverage earlier this year. 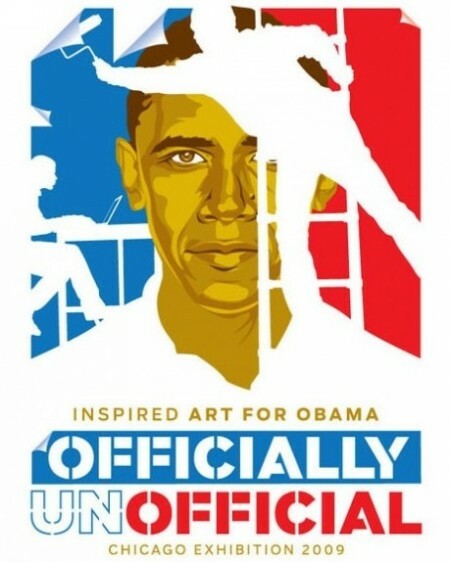 Â Curated in the same vein, Officially Unofficial brings together many of the great artists who contributed to Obama’s Presidential victory, including Shepard Fairey, Alex Pardee, Ron English, Sam Flores, David Choe, Robbie Conal, Zoltron, Eddie, Munk One, Morning Breath, Tristan Eaton and CRO. Â There will be a special preview part on Tuesday March 31st, to RSVP please visit Going. Categories: Art, Contemporary Art, Low Brow & Pop Surrealism, Shows & Events, Street & Urban Art. Tags: Barack Obama, Cro, Manifest Hope, Obama Art Report, Officially Unofficial, Ray Noland, Scott Thomas.